German Wines? German? And Wines? Am I hearing you right? The title is a nod to the Peter Kay Garlic Bread sketch many vines ago, in case you were wondering. Today, in a second hand bookshop I bought The Atlas of German Wines. I would have preferred the Atlas of German Sausages but you can only buy what’s on the shelf. Browsing the book I was impressed with the printing of the maps; colourful, detailed and understandable. I scoffed the book up and took it home. Further analysis in the homeland made me question my monetary decision (two quid, in case you were wondering), I mean, are the Germans famous for their winemaking? German and Wines? Call me Latin if you will but I had heard that the Italians were the best grape growers and squashers. Yet I hope to copy Peter Kay’s epiphany when tasting garlic bread by enjoying the taste of fine wines from Germany. My dreams of Rhine wines was brought back to reality by my wife. “You don’t like wine. German, Italian or Chilean.” Chilean wine? Chile? And wine? Chilly wine, perhaps but not Chile wine. She was right, though. I don’t like wine. It gives me the lethal cocktail of a sore head and indigestion. (don’t anybody start with a – sore head and indigestion? Sore head? Indigestion? witticism). The wine idea has gone down the drain. I’ll stick to the tried and trusted. From here on in it’s only pints of beer for me. And I’ll be on the look out for a book on German beer. Or sausages. 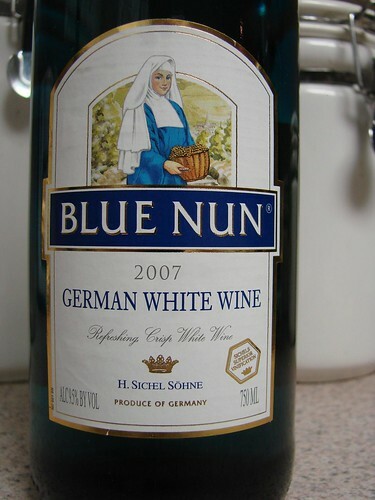 The infamous Blue Nun! It’s a wine-y cocktail. In the Moselle region wine has been grown for roughly 2000 years.The Romans brought grapes with them and a white wine industry developed in towns and cities under their control. Me? I’ll stick to junmai ginjo or single malt. German wines? It’s the future! If Alsace is in Germany, they do fine wine! And hock? Your gasthof is nowt wi’out a hausrot. Oh, come on, it was funny. Beer! What dreadful drink is that? A couple of weeks ago, after a very hot and humid spell, Bearsy and I went out for dinner. We were sooo thirsty, we decided to try a long, cold beer. One sip was sufficient to remind me that I loathe the stuff and I reverted to wine – much to the amusement of the young guy in our local eatery / pub. As for German wines – may I remind you that the wines from the Barossa valley (in SA, Oz in case you don’t know! ), from whence come some excellent wines, was settled by Germans. My daughter and I plan to visit my grandson in Adelaide in the next few weeks – and he’s promised us a ‘wine-tasting’ tour of the vineyards. Sounds fun! Hope you didn’t mind me hauling myself up from underneath the wheels of the Chariot and onto the wagon again. Or off the wagon, as the case may be, after all I did bring a few crates of beer with me and a bottle of good old Blue N. Enjoy your day out with the grapes. Although, I’m not too fond of oenophiles with their dainty little sips and wine lingo. Fruity, oaky, dokey, corked, Crisps. What are they on about? Connoseurs, my beer drinking arm! Wasn’t it Austrians who added anti-freeze! Like the English, the Germans make some very good white wines. Also, like England their reds are not so good. It is all to do with climate. My favourite reds come from Chile. German brandy is excellent too! FEEG, pros’t! Yes, we have a wide choice of German beer here, probably better than Carlsberg! Some Austrian wines like the Grüner Veltliner from the Danube valley are very good. Yes, Sheona. Pity it was Austrians involved in the 1985 scandal. I used to spend a lot of time travelling by car in Germany in the 80s. The Mittelrhein area has superb white wines that they are very careful not to export. I have never seen them anywhere else in Europe. We used to bring back as much as the car could carry. All the export stuff appears to be rubbish. I suppose you could use Blue Nun to throw over your enemy’s car? CO: German wines have really gone downhill in recent years — much like Germany, really. In the past there was more pride in its production. Most vineyards grew their own grapes and were responsible for each stage of wine-making. In the past few years more and more wine makers simply buy grapes and press them without really paying too much attention to their provenance save for the general area. This has been done to cut costs and compete with plonk from Italy, Spain, the US, New Zealand and Australia. I never drink named brands, tend to go for varietal wines. Have had some excellent Viogner wine out of California. Cheap because people do not know what it is, they want their Chardonnay! Equally, Argentine Malbec is extremely good value. I think most Australian NZ wines are seriously overpriced here these days for the quality. I have a strict $6.00 per bottle limit for everyday drinking and it is quite amazing what you can find if you punt about a bit. What connection does a scandal thirty years ago have with today’s wines? I thought it was Italy that added “extra ingredients” anyway. Sheona, of course, but I need a quote now about not repeating history or else. After the Austrian case there were other discoveries in both Italy and France.